FAI Executive Vice-President John Delaney. THE FOOTBALL ASSOCIATION of Ireland said it is taking urgent steps to address its current governance and financial issues as the governing body comes under increasing pressure. 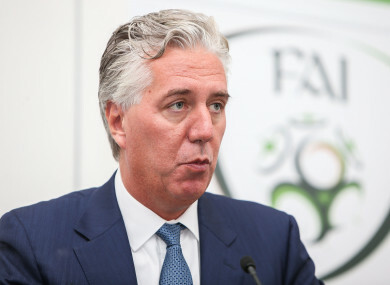 The FAI released a statement on Sunday evening addressing comments made by Minister for Tourism, Transport and Sport Shane Ross, who raised the prospect of State capital funding being withheld from the FAI. An FAI statement said: “The Board of the Football Association of Ireland notes the comments made today by the Minister for Tourism, Transport and Sport, Shane Ross, and by Deputy Fergus O’Dowd, chairman of the Oireachtas Committee on Sport. Sport Ireland decided to suspend and withhold future funding to the FAI this week. The FAI said it is engaging with Sport Ireland on the composition of a new governance committee with additional independent members and the appointment of an independent person to the committee of the board examining the current issues. The Association also said it plans a root and branch review including of its rules and processes. Sunday’s statement failed to mention under-fire former CEO John Delaney, who appeared before an Oireachtas Committee hearing on Wednesday but refused to answer a number of questions relating to a €100,000 loan he provided to the FAI two years ago, citing legal advice. Email “FAI says it is taking 'urgent steps to address its current governance and financial issues'”. Feedback on “FAI says it is taking 'urgent steps to address its current governance and financial issues'”.